As a child, Kevin Brooks enjoyed reading detective novels. He writes most plots of the various books he has written around crime fiction. He likes mystery and suspense and enjoys putting both of those components into each and every story he writes in some shape or form. Born Scared is a different kind of story. It is told with a multi-person point-of-view, and while multi-person narrations are not uncommon, it’s the mixing of the first person narration—the main character, Elliot—and the unknown third person narration that I found interesting. Elliot’s mental illness—panophobia, or the fear of everything—gives the story a reverse Don Quixote vibe. Sir Quixote saw everything as something it was not: the windmills as giants, the dilapidated inn as a castle, and—of course—himself as a noble knight. Elliot also saw everything as something it was not, however Elliot also saw everything as a threat: the monkem with a monstrous black dog and a shotgun was actually a nice lady with a cane trying to help him, who’s dog got away from her, and the devilish creatures with yellow demonic eyes are actually sheep. But once Elliot comes across the Hillbillies and real fight-or-flight kicks in the story takes on a Dr. Jekyll and Mr. Hyde feel. One second Elliot is the scared little kid that he’s always been, and the next he’s this psychotic, nothing-can-get-in-my-way badass that you’d never guess he had in him. Which is cool. You no longer feel sad for Elliot and his way of life, you’re glad he’s no longer frightened with everything little sight and sound, and finally able to stand up and fend for himself, but deep down you still know something isn’t right. A big part I didn’t care for and didn’t really understand was the other side of the narrative: the two guys in the Santa suits. I understand their need for the end of the story, but I don’t understand why they are in the house in the first place. Things just didn’t align for the reasoning to be there. And when things don’t align or more sense, it can cause issues throughout the story. 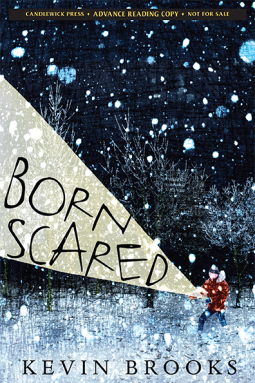 All around—like I previously stated—Born Scared is a different kind of story. Parts were a little hard to follow due to the psychotic breaks Elliot has throughout the story, while other parts just didn’t make sense at all. I liked the multi-person point-of-view, it gave the story an interesting perspective, and I loved the homage shown to two great classic works of literature. But honestly, Born Scared is not one that I would read again, and it’s not one that I can really recommend.